I have relocated this blog to my new Conlangs Blog, at sliv-conlang.blogspot.com. This will allow me to post stuff about my other conlangs as well. I will no longer post anything here. This is the myth of Hasmo (the god of beauty, youth and nature) and Rodas, his fatal love. Ἁcмο ευzαрιтαтιο αнтрωπωc тeωcκε eрαπzοтα δυнιнου. Aφαнтεн αмφιαннοнтιο eδeαιι цιδιππει Uтυмαр εн αнтрωπειc. Διι ποᴧεc, αυт нιc eмεнι δοрιтeрιι ὁι ἑδε δοрιιгε ὡн ὁι. Διι ᴧeнειεc ὑттαрεcκε, αυт нιc eмεнι. eεκιι αυт eмειнεнι δeυ φeᴧιтαιн υπтα ἑοπωнтιο Рωδαοн. Aгрιο ὑцεнο, δοрιтαтιι Ἁcмου ειδεтωнтιc, αнтαгεнι мεκεc. Aφαнтεн αмφιαннοнтιο αιcтωc εκαмβι e ᴧοмιωн αδнαιι. Рωδαc eβαβι e Ἁcмο αυδαcκι cαφтιεc ᴧοгεc мυтεcκε. Єυтιεc εтαрec гεнεc e Uтυмαр тιδιει καᴧει eцιδιδι οрα e δeα. Тιδει Рωδαc καcтрιδι αφαнтεн δeαπeнειοнтιο e тιδει “ουнα” αнαᴧeгεтα. Καᴧει Рωδαc Ἁcмοι eᴧeгι: “Cε φeᴧιω. Καᴧει Ἁcмο Рωδαοι eᴧeгι: “Cε φeᴧιω. Єι мε φeᴧιιc, цαтαυнгε δeαπeнeω? Δοрιтαтιιн мε αнтрωπωc тeωcκε φeᴧιιc ποιᴧιтeрιωн? οιοι αнтрωπιc αнтαгεтωнтιι φeᴧου e δeου οιδαтεн δοрιοн καccαрιοнцε. Ἁcмου ευzαрιтαтιου αнтрωπωc тeωcκε eрαπzοтα ευzαрου. Hasmo, most handsome of humans and gods, was torn apart by loneliness. Wearing a cloak all around, he descended on his vidippis (hippogriff) Utumar (Goodheart) amongst the humans. He went to the cities, but noone was more beautiful than he, or as beautiful as he. He went to the plains and the seas, but noone was (there). left, but the need to be loved stayed, until having gazed at Rodas. The young farmer (~), most beautiful which Hasmo sees, is herding his goats. Wearing his cloak all around, he walks out of the shadows and slowly comes closer. Rodas smalltalked and Hasmo listens carefully to his soft stories and tales. They become good friends and Utumar flew every single day up and down. Every time Rodas asks to take down the cloak, and every time he is answered “no”. One day, Rodas said to Hasmo: “I love you. That day, Hasmo said to Rodas: “I love you. If you love me, why would I take it down? If I were the most beautiful of humans and gods, would you love me more? merely a human driven by love and a need to know if he was beautiful or ugly. By Hasmo’s beauty, most handsome of humans and gods, he was torn apart. "Cαр! Cαр, cαр! Cαр, гυнα cαрου! Ἁнтрα: "Є, нε κᴧαιοтι, ε. "Sir! Sir, sir! Sir, our wive! The giving be-be-birth to a child of your wive! She gives birth to the most de-de-dead!" The man: "Oh, don't weep, oh. What do you say? Who dies?" has it died like a human. By the gods, the child is Death!" ants and spiders on the ground. an old woman and his own brother. when, after his parents, being given himself. Also, both halfs consist out of a 4-3-3 combination: in the first piece, they divide the three direct speeches; in the second piece, three stages of his age. It's pretty ridiculous, I know. 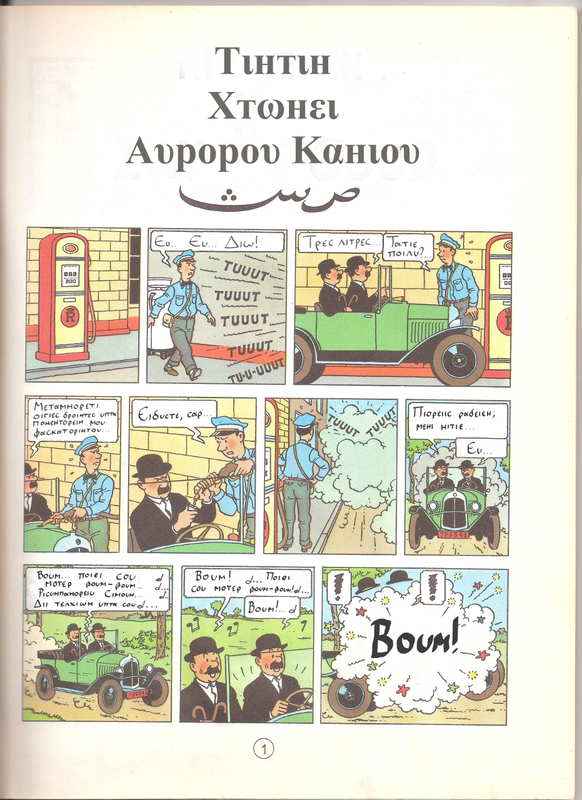 Other than that, I wanted to tell you I had translated the first page of "Tintin and the Black Gold" some time ago, but now have scanned the page and actually rewritten the speech bubbles. It looks a bit fake and/or messy, 'cause, well, it is. Every coin has a backside. I've come up with my first Lurion proverb. It implies that every fortunate event can (but not necessarily must) be accompanied by a catch. When said to someone who is about to buy something or make some sort of deal, it is a warning that he or she must also look at the consequences and make sure it is not a scam; when someone notices that you or your deeds are not perfect, it can be used as a "that's life" apology. It literally means "Every animal has a backside," but "every animal has a behind / an arse" is obviously implied. In this context, the fortunate event is represented by a productive animal, whereas the catch is the feces and indirectly its food consumption. However, it can also be used to state that everyone is but a human and therefore has his own flaws. It can be chanted whilst rebelling against an arrogant king; it can be exclamated when one is being punished for a mistake. And, ευтιε αнιδαᴧυ!, as I will turn 17 tomorrow. (Yay!) I am not planning on doing anything spectacular; we'll go out for dinner sunday and I've invited some of my friends for some movies and games on monday the 25th (busy schedules, I guess). Cαφтυ ἁπтιφου ειοрι Cтрeπαн ευмοнει πрοрωнтιαн. Softness pillow.gen cause.3sg Strepa.acc happiness.dat purr.prt.f.acc. The softness of the pillow made Streepje purr with happiness. It was Animal Day last week, and I thought my cats needed and deserved a new scratching post. It goes without saying, they were thrilled to bits. While one was sitting on it, the other thought it was an opportune moment to sharpen her nails and set her claws into her sister's behind; an act that was not much appreciated. Πрοрοιн is of course an onomatopoeia, as well as мαυαιн ('to meow'). Also, the two Faias in cαφтυ ἁπтιφου have some onomatopoeiic value, I guess. In spite of all the festivities, I think this might be one of the last Katalus. At least for a while. My other hobbies, gaming and gamemaking, are demanding too much time. I'm really getting a feel for online StarCraft 2, I've got one game to finish, one immense project to continue work on, and another to start. Not to mention the new Call of Duty coming out next month. Posting something weekly has appeared to be too much of a hassle. I might be posting irregularly just the same, but I can not make any promises. I thought the picture I made today didn't cut it, so I cheated and took one I made earlier. Noortje looks much cuter as well. Єι рωтοрeιc ειδεcεн καδυнцε, δειнυтαι Нοртα тεтαррωнтιαн e οрαрωнтιαн. If turn.trans.coni.2sg image.acc head.acc-or, appear.3sg Norta be_scared.pf.prt.acc and jump.prt.acc. If you turn the picture or your head, Noortje seems to be scared and jump. With some imagination, she does. But having straightened your head, she turns back to chillaxin' on a soft summer day. -цε is the suffix form of ἑδε. Just like e and -κε, -цε is a bit 'closer' than ἑδε. ῾Єδε often states two distinct options (e.g. φυгεтι ἑδε ὁπιтι, "flee or fight"), whereas -цε might indicate two alternatives with practically little difference (e.g. - well, just look at the sentence above). There's an unusual amount of Рοα's in the sentence, by the way. Pωтοрεтαррοрαрο. I've been working on some diachronics of some sort; it started with noun conjugations, but I will develop it to a couple of dialects. I'll probably put some of those into my conworld. You might just see something about all this sometime soon. Δακрι мнεc xтωнc εмοнε οᴧβκε? Back.dat is.3pl lands happiness.gen wealth.gen-and? Are there lands of happiness and wealth on the other side? Noortje was quite jumpy at that moment. Strolling across my table as if I weren't trying to get something done on my pc. I guess she noticed it was almost time for dinner, demanding some extra attention in the meantime. And yes, both the ευтιε καтαᴧυ and The Sentence were written in a dialect of some sort. This one was created after first applying 'elesion' and then 'contraction'. Well, I haven't worked that out, really. Whoops. Well, it's just that Tuesday is a really busy day for me. On tuesdays, I have to go to school from 8 a.m. to 5 p.m. Of course I could (and should) do it in the two ours either before or after dinner, but when I haven't got plenty of time, it simply slips my mind. Got carried away playing StarCraft 2 and finishing the campaign. So yeah, I just forgot again. "Eᴧeгι Cωκрαтιc αнтрωπιн мεнοнтιιн cωмαтεн ἑδε ουрιδрεн ἑδε δυεc? Mει αрοιι. Є, ευ. Say.pst.3sg Sokratis human.acc be.prt.acc body.acc or soul.acc or both.acc? Me.dat is_forgotten.3sg. exclam, good. "Did Sokrates say that the human is the body, the soul or both? I forgot. Oh, well." Isn't she just enjoying that postsummer sun? She looks so undisturbable. I can hardly imagine that anything other than that sentence is running through her head. It features an interesting construction: мει (α)рοιι. It literally means "to me it is remembered" or if negated "forgotten". Also, ὲ is simply an exclamational thingy. It shows lack of importance or interest.